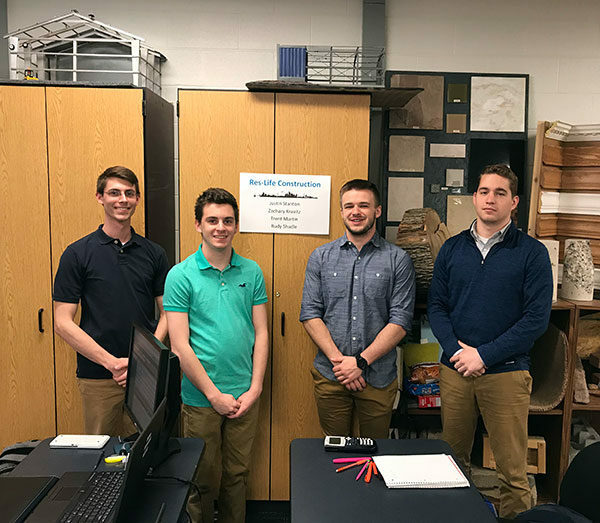 The first Penn College Construction Management Competition, a two-day event primarily orchestrated and judged by three students about to graduate, has crowned its first champions. Collaborating with Herr were Calen B. Heeter, of Emlenton, and Chekota J. Newhart, of Troy; all three will receive bachelor’s degrees in construction management on May 18, when Herr will deliver that morning’s commencement address. Chosen as winners of the competition was Res-Life Construction – comprised of Rudy C. Shadle, of Mechanicsburg; Trent D. Martin, of Ephrata; and Zachary J. Kravitz, of Berwyn; Trent D. Martin, of Ephrata; Rudy C. Shadle, of Mechanicsburg; and Justin L. Stanton, of Newfoundland – one of three four-member teams to take part. The inaugural competition was held April 11-12 on the second floor of the Carl Building Technologies Center. “They communicated and worked well together throughout the competition and they consistently delivered professional and logical packages,” Herr said. Among the performance areas assessed were estimating, scheduling, the scope of the project, selection of supplier selection and an interview about each team’s respective proposal. Working together as “The Cranes” are (from left) Thompson, Hendershot, Tabon and Grates. Also competing were PCCM (Darren L. Dreas, of Macungie; Adam Z. Hutchinson, of Greensburg; Nathan G. Kress, of Sciota; and Carl A. Zimmerman, of Hunlock Creek) and The Cranes (Tom A. Grates IV, of Tarentum; Seth G. Hendershot, of Dunkirk, Maryland; Nathan I. Tabon, of Allison Park; and Brendan B. Thompson, of Womelsdorf). Student judges were assisted in scoring and review by three industry representatives: Patrick Judd, senior project manager at The Whiting-Turner Contracting Co.; Chad Maholtz, senior project manager at Leonard S. Fiore Inc.; and Brandon Miller, area manager for Henkels & McCoy Inc. The members of PCCM (from left) are Kress, Zimmerman, Hutchinson and Dreas. The competition was open to juniors, sophomores and freshmen, and teams were required to have no more than two students from a given grade year to encourage more involvement and to spread the experience levels, explained Wayne R. Sheppard, assistant professor and department head for construction management. Sheppard had high praise for the three seniors, who used their combined experience from nine industry competitions to formulate the event. They also will take that experience into their imminent postgraduate employment: Heeter and Newhart have been hired by Turner Construction, the former in Pittsburgh and the latter in Philadelphia; and Herr has accepted a position with Centurion Construction in Lewisberry. Teammates and student organizers (Newhart at far left, Herr and Heeter at far right) gather for a group photo taken by Sheppard. Congrats to all for a great competition!